"Nonfiction literature of a high and lasting order . 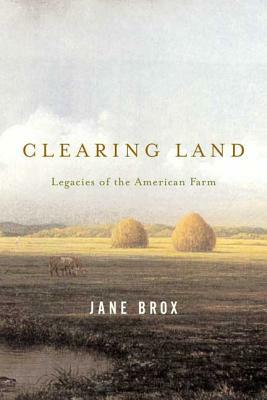 . . Clearing Land, [Brox's] third book, parlays the resonantly detailed specifics of life on her immigrant family's farm in Massachusetts into a larger consideration of the meaning of cleared land and its relationship to other iconic locations in the American landscape: wilderness, prairie, mountain, city. Her precise, eloquent prose, wedded to a sensibility that manages to be at once elegiac and hard-minded, strikes unerringly through sentiment and convention to the heart of the matter . . . The result is a deeply affecting conclusion to her trilogy of books about living the consequences of natural process, human desire and the shifting balance between them." "Sings with the joy of life . . . Brox knows farming, but she knows writing even better . . . Clearing Land is a treasure." "Clearing land is the book's guiding metaphor, one that encompasses both time and space, and serves brilliantly to compare the material world and its flux with our attempts to understand it. . . This [Brox] does with eloquent melancholy." Jane Brox is the author of Here and Nowhere Else, which won the L.L. Winship/PEN New England Award, and Five Thousand Days Like This One, a finalist for the National Book Critics Circle Award.